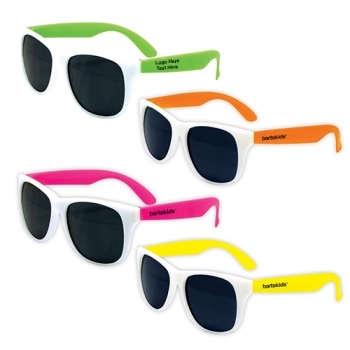 Promotional White Frame and Neon Arms Classic Neon Sunglasses are superb promotional gifts for resorts, schools and any brand planning a fun event for their little patrons. These custom sunglasses are featuring UV400 lenses and are made of plastic. The White frame-Neon arms combination works well when it comes to getting attention of the kids and their parents. Apart from the default 1 1/2" x 1/4" imprint location in the left arm, there is also an alternative imprint location available in the right arm. 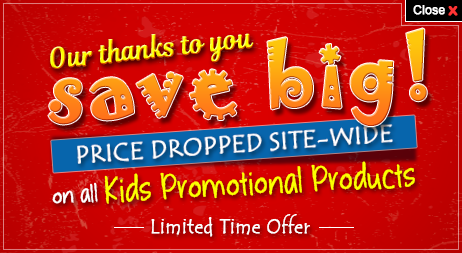 Order these promotional kids products fast to get free artwork design and free online proofs services. Request a quote to know the value savings that you can avail on bulk orders of Promotional White Frame and Neon Arms Classic Neon Sunglasses.